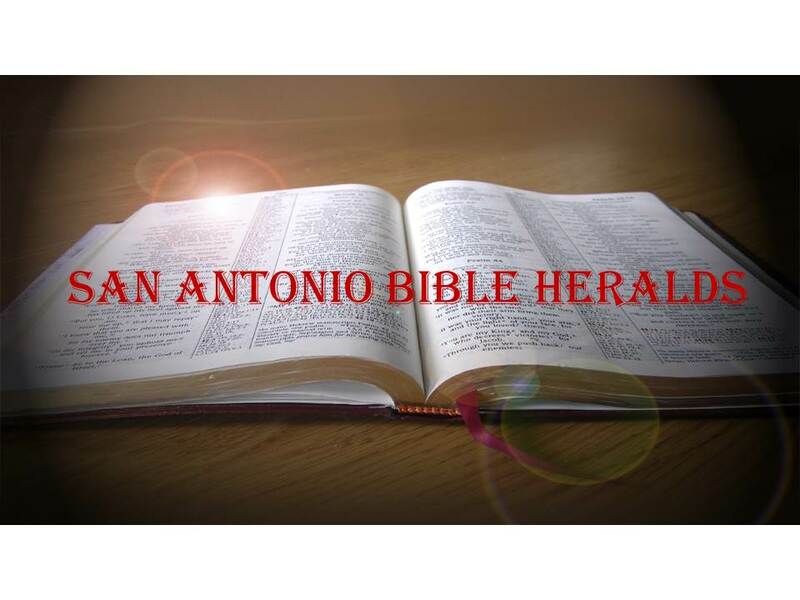 San Antonio Bible Heralds: "Ye are all one in Christ!" The first thing that needs to be said here is that I, and likely many of you who are reading this post, have not experienced what this individual has during his lifetime. I grew up in Puerto Rico, an island that is overwhelmingly composed of mixed raced individuals. Race in my native land was, and I dare say to this day is, an issue that is seldom heard and that makes little difference in how individuals relate to one another. Alas, that is not what many people of the black race have experienced in this country. It is not my intension to justify or condemn what people believe based on their experiences. And I do not pretend to set myself as a judge over people's feelings. That being said, however, it is truly astounding to me that any Christian would express fear of his fellow believers simply because they are of a different race. To me, that is a clear sign of a lack of Christian maturity that needs to be urgently addressed. After all, the very scriptures that this individual would appeal to for a color-blind church, are the same that tell him that race, social status, economic position, are all insignificant when it comes to how we treat each other and how we love each other. Either we accept those injunctions for what they are, or we don't. We cannot accept the scripture on the one hand, and then turn around and abandon it when it suits our purposes. That, unmistakably, is what the people of the world are constantly doing. Paul told the Colossians that Jesus Christ is the head of all things and that in Him creation was brought forth and all things hold together. But the real key here is what comes next since Paul goes on to tell us that Jesus reconciled all things unto Himself through His cross (Colossians 1). The same thought is also carried through in Ephesians 2 where Paul tells his readers that Christ brought down the middle wall of partition bringing together both Jews and Gentiles into the one body. Thus, all of us have been reconciled by the blood of Jesus' cross and the idea that there is a difference between one race and another means nothing in the sight of God. As such it should mean nothing in our sight as well. It is important to remember that at the time that Paul wrote those words, the primary division in the world was not so much racial as it was economic. Slaves came from all races and were primarily slaves by necessity, i.e. they had no other way to survive, or they were spoils of war enslaved by the conquering power. In the Jewish mind, however, their racial superiority held a very important place in the life of their nation. The Jew looked upon himself as the elect of God and all others were little more than, as one saying of the era had it, "kindle for the fires of hell." You can begin to see, then, how the idea that the gospel brought forth the equality of all under its precepts was so radical. Thus, our world has nothing on the ancient world when it comes to prejudice based on race. 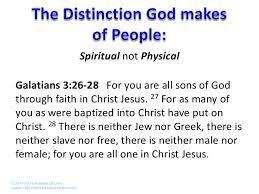 One more thing, when Paul stood up to Peter in Galatians 2 because the latter was making a prejudicial difference between Jews and Gentiles, it forever made clear that in Christ our identity goes much deeper than the color of our skin. We are not judged based on how we look, but on what, or better yet, Who is within us: the Holy Spirit of God. If the Spirit is indeed dwelling within us, we cannot possibly hold any of His people at arm’s length. If we do, then we truly have to question whether we have really been regenerated. In the final analysis, it is our relationship to the Christ that makes us who we are, not our personality, our appearance or even our intellect. If we do not see it in those terms, our understanding of what Christianity is all about is truly warped.